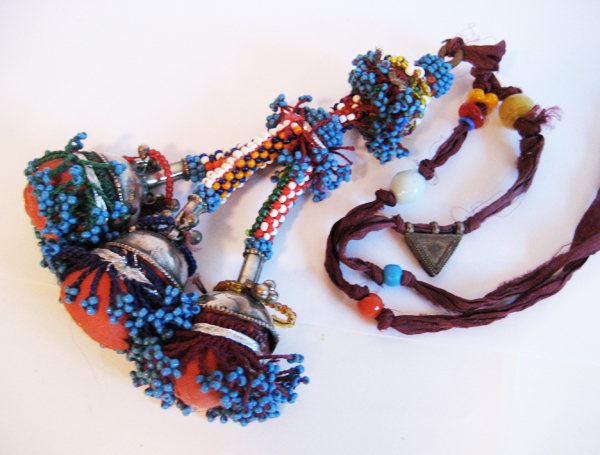 The completed necklace above is fashioned from an Afghani artifact, a heavily beaded tassel, probably used to decorate a camel. This is unlisted due to my complete inability to part with it. 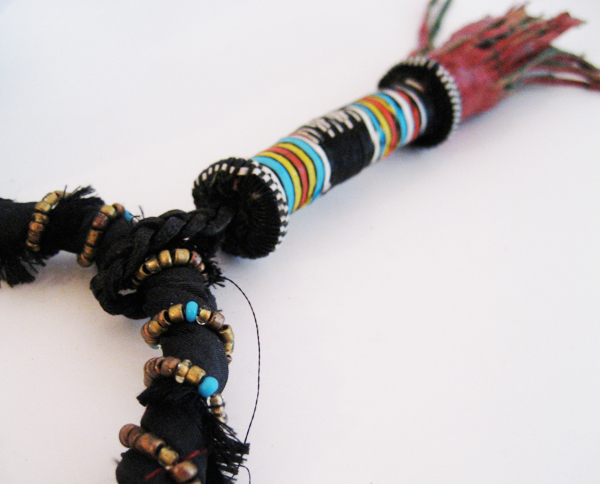 Here then, is another gorgeous tassel I’ve been trying to work with, this one is African and made of leather. The colors are amazing, both dirty and brilliant in perfect combination. The beaded ring is my addition but I can’t seem to properly finish this WIP. 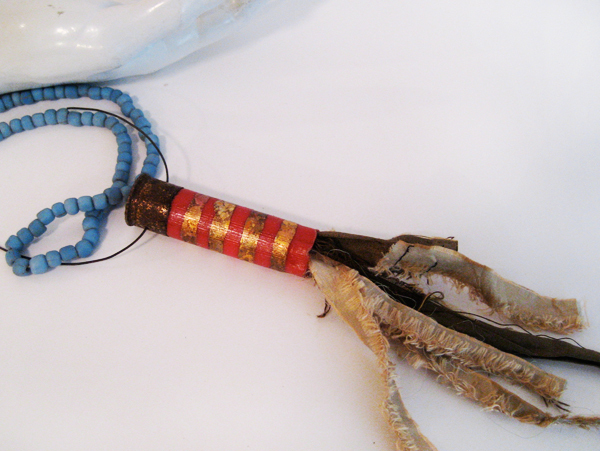 Above is the most recent tassel experiment, made from an upcycled plastic Winchester rifle bullet casing that is insanely rusted and distressed, then gilded (of course). I have a batch of these in the most wonderful desert-faded colors. This is all very unfinished, just playing right now with materials and thought you’d enjoy seeing the influences leading to the design. 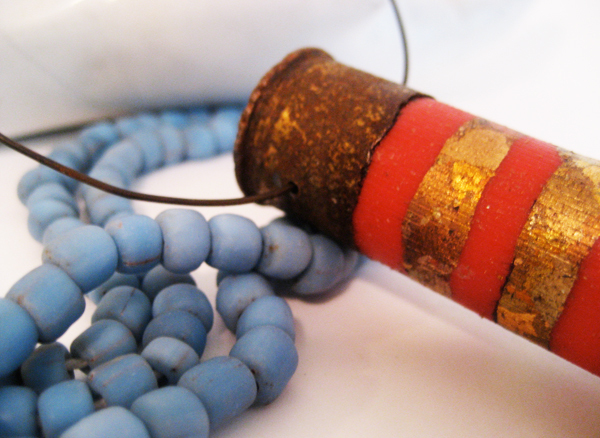 I know I will be using these Indonesian blue glass beads; amazing color against the red. 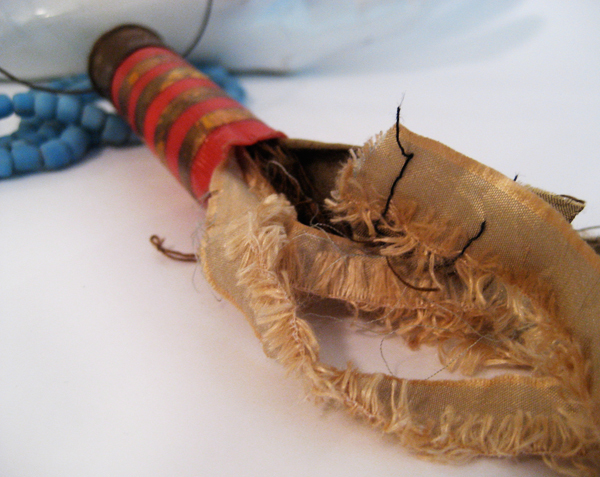 And the Indian sari silk fiber is working for me. I love how all of these tassely objects are related to one another, coming from arid deserts and plains, the recycling and repurposing, how in some cultures even the animals are adorned to the hilt… but the humans too. I don’t know what I’m saying, I’m just…. 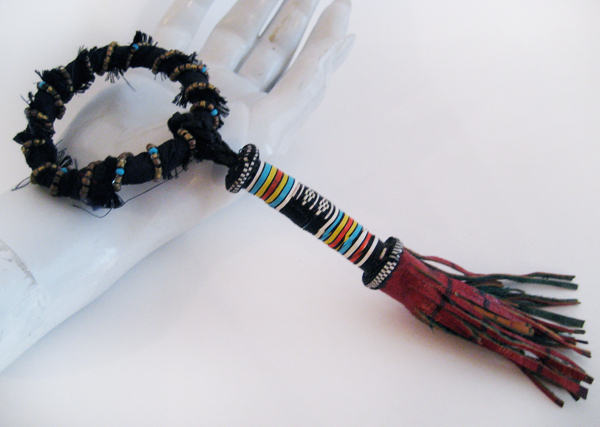 all jazzed up about… tassels. These pics are over on flickr in case you want to ogle them larger. Lastly, I am planning to donate a portion of proceeds from any/all jewelry that utilizes bullet casings to a US gun control organization, so if you want to recommend one, please comment or email me.